ROCKS……..STONES…….CRYSTALS……call them what you want….I have many!!!! I know when I am being selected by a crystal because I start having obsessive thoughts about it. 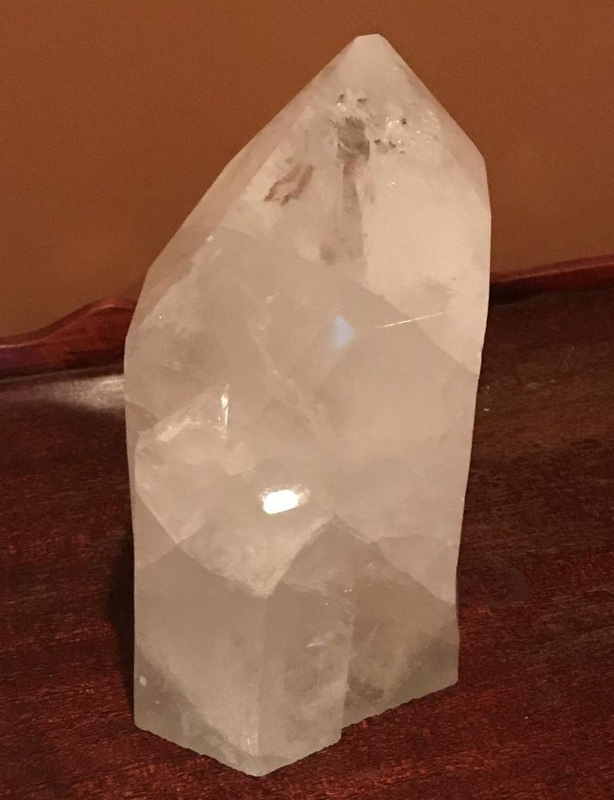 I cannot stop thinking about that particular crystal and where it will sit in my office or home. I will even know its purpose, or the benefit it will bring into my life. This is not a desire to own or possess “it”. The crystal will have a specific purpose in my world. I am always on the lookout for crystal shows whether I am searching for something specific or not. So, I attended one of my favorite shows. In this case, I was not looking. I walked into the first room and my eyes were drawn right to this fabulous clear quartz generator……I will explain what a generator is later. I said to myself I am not looking for anything. I continued to walk around the show and eventually found myself back in the first room looking at the crystal. I was now arguing with myself that I did not need any crystals. I walked away. I bumped into a friend and we spent a few minutes chatting then she said to me…..”That crystal over there is talking to you. Did you notice that crystal?” Needless to say the Crystal came home with me. Her name is Rose. Rose is a ‘Generator’. This means she is a strong power source for other crystals, like a battery. This type of crystal usually has a large point, six equal sides and six equal faces that lead to the point. Rose keeps all the other crystals in my office vibrating at their highest frequency. Rose is awesome!!! What’s your favorite crystal story?